With all due respect to all of the amazing chefs who participated in last week’s “Beyond Bubbie’s Kitchen” event, the best dish (in my opinion!) was the schmaltz bun with lamb by the line cook at Tres Gatos in Jamaica Plain. And when I found out the chef’s name was Menachem Ezra Jarred Randall, and that he was hosting a pop-up event next week featuring modernized Jewish cuisine, I basically insisted he be in this week’s column. 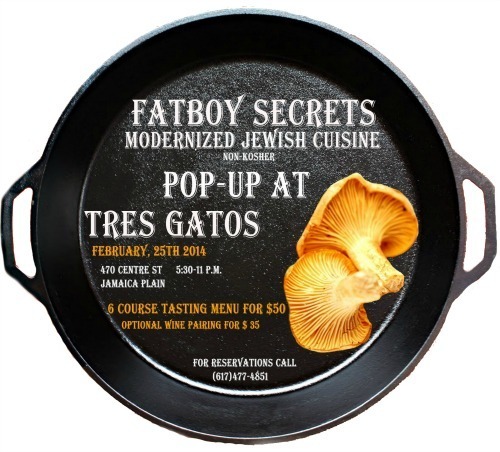 Fatboy Secrets will kick off next Tuesday night, Feb. 25, at Tres Gatos. The six-course tasting menu is $50 with an optional wine pairing of $35. For reservations, call 617-477-4851. Tell me about Fatboy Secrets. What’s the secret, and who is “Fatboy”? Fatboy Secrets is a pop-up restaurant focusing on modernized Jewish cuisine, reimagining classic Jewish flavors and presenting them in a new and unexpected form. My goal is to reset people’s expectations of Jewish cuisine and show them it can be more refined than just deli food. The name came from me just being a fat kid at heart. I always had an obsession with food, even before I started cooking. Every conversation almost always led to food, so much so that my friends would whisper “fat-boy secrets” every time I would start talking about food. Fatboy Secrets has a humble and endearing quality to it, so I decided to use it for the name. We are going to be popping up at Tres Gatos in Jamaica Plain on Feb. 25. It’s going to be a fun night with a six-course tasting menu, with dishes like gefilte shrimp (cauliflower, beets, carrots and pickled horseradish), helzel (chicken liver, foie gras, chicken skin and prune) and cholent. You were raised as Menachem and now you’re known as Jarred. Plus now you work at a restaurant that’s big into pig. How do you square those two worlds? My full name is Menachem Jarred Ezra Randall, so I was given both a Hebrew and English name, and Jarred is a bit more forgiving on people who aren’t used to the “chhha.” And it’s easy: pig is delicious. It’s something that I wasn’t allowed to eat growing up, but once I tried it I fell in love. When you’re not cooking, you make music. What do you play? I don’t play as much music as I used to. 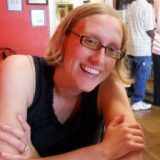 I used to be in a rootsy, psychedelic rock band, where I played the piano and sang. But I really focus on my food now. Other than fishing at Jamaica Pond, I don’t really have many hobbies beyond cooking. The movies I watch, the books I read, it all seems to go back to food. Your mustache is one of the more impressive I’ve seen. Who has your favorite mustache, living or historical? That’s a hard question! 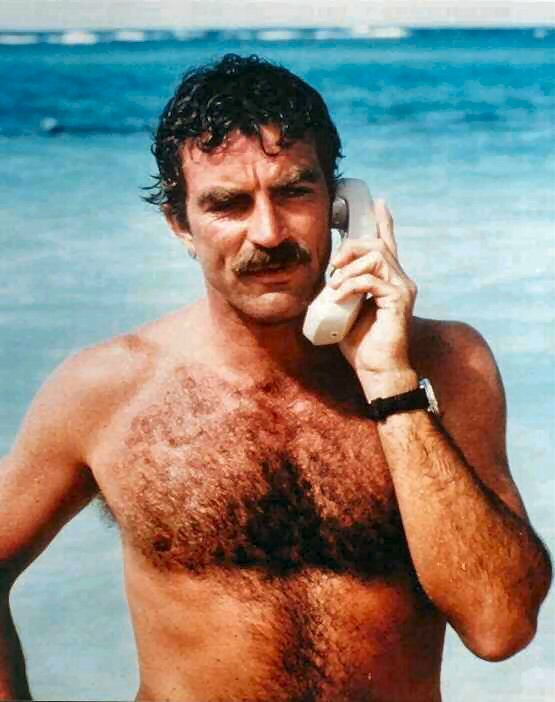 Tom Selleck, for sure. He has such a classy mustache. The key to a good mustache is confidence. 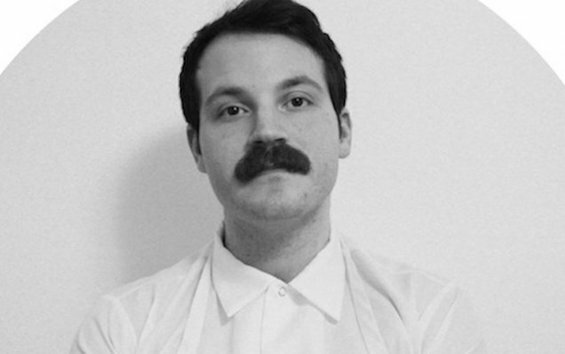 A confidant mustache shouldn’t be tinkered with, and it doesn’t need wax.